Since 2014-15, Miami has won just 36 games, its lowest three-season total since 1989-92. As a result, the RedHawks parted ways with two assistants and 11 players this off-season and they hope the influx of new talent – both on the ice and the bench – will vault them to more victories. Coach Enrico Blasi (photo by Cathy Lachmann/BoB). With all of the moving parts within the program, game-action anticipation has never been greater. 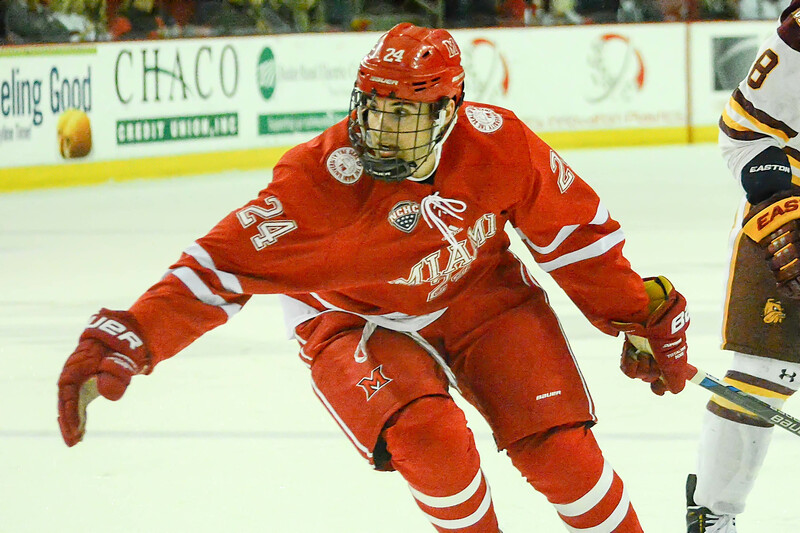 Fortunately for the RedHawks, opening night is Saturday vs. Alabama-Huntsville. Peter Mannino was hired as associate head coach at the end of March, and Joel Beal was named assistant in June. Mannino, a former NHL goalie and NCAA Tournament champ with Denver, was an assistant at in-conference rival Nebraska-Omaha last season after winning a Clark Cup as the assistant of the USHL’s Chicago Steel. Beal was an assistant at Sacred Heart the past five seasons and an associate head coach since 2016, and on the ice he starred at Union in the early 2000s. Senior co-captain Josh Melnick said the energy the duo has brought to the program has been contagious. Miami’s roster, which was not completed until late July, features five new forwards, four on defense and two in net. Two of the 11 are graduate students completing their fourth years of hockey eligibility. Grant Hutton (photo by Cathy Lachmann/BoB). Both Melnick and defenseman fellow co-captain Grant Hutton love what they’ve seen from the newest Hawks. During the summer before the new players arrived, the returning players reached out to the freshman class to welcome them to the program, Melnick said. The off-season didn’t start well for Miami. Within days of the RedHawks’ final game, it was announced that assistant coaches Brent Brekke and Nick Petraglia would not return as well as four players. Two other prominent forwards also left the team early in the off-season, with one turning pro and the other transferring. That’s on top of Miami not qualifying for the NCAA Tournament or even making it out of the NCHC quarterfinal round for the third straight season after qualifying for 10 of the previous 12 national championships. Some positive things happened this off-season well. 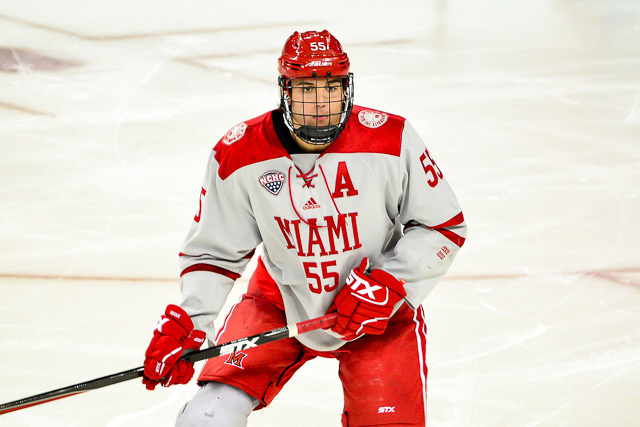 Multiple prior Omaha recruits switched to Miami following Mannino’s hiring, including defenseman Derek Daschke. Miami’s Ryan Siroky (photo by Cathy Lachmann/BoB). And both Melnick and Hutton, both seniors and destined for lucrative professional careers, announced they were returning this fall. Miami played some quality hockey down the stretch last season, and Blasi said his team will seize that momentum and carry it into this campaign. He pointed out that Miami was ranked as high as No. 14 in the PairWise after its big January home win over powerhouse Denver. 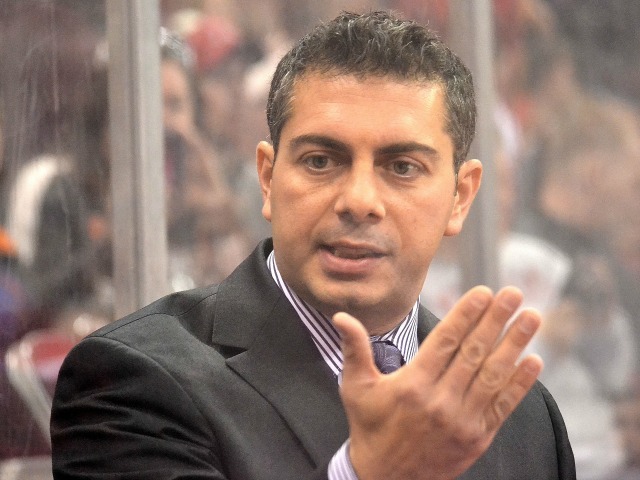 Blasi said that he, as well as both assistants, have been actively involved in recruiting this off-season and has hit the road with one or both on several occasions as Miami tries to fortify its roster for the coming years. Though the season doesn’t start until Saturday, Melnick he noticed a marked difference in the locker room already. Check back for a positional breakdown of the RedHawks. 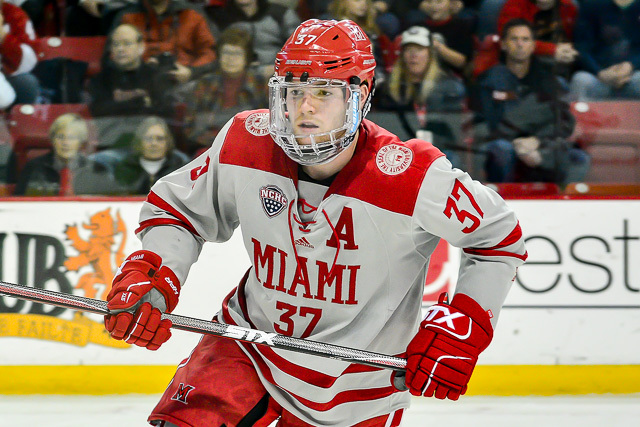 Posted on October 4, 2018, in 2018-19, preview, Uncategorized and tagged 2018-19 miami redhawks, Enrico Blasi, grant hutton, josh melnick, NCHC. Bookmark the permalink. Leave a comment.